Theo is a stunner. He gives amazing cuddles, which means he's proved easy to sell to our customers! 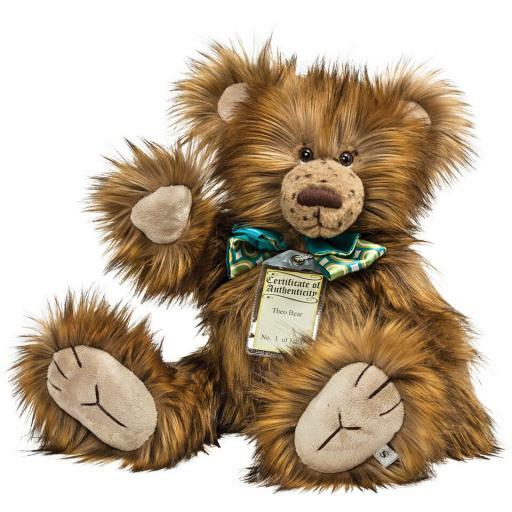 He is made of rich multi-tone material, light brown graduating to dark brown plush. His brown eyes are accentuated by white material, and he has a painstakingly shaved round muzzle, that reveals a sprinkle of cute freckles and a dark brown nose. His ears and pads are made form lighter soft boa material, with his fingers and toes stitched in. He's wearing a beautiful green stain double bow tie, patterned in retro circles. As with all the Silver Tag bears, Theo is fully jointed, substantiallyweighted, and has a classic hump. Theo comes with an individually numberedCertificate of Authenticity. He is 57 cm standing. Theo is one of 1500. Hecan be spot cleaned. Numbers now limited.